Now might just be the perfect time to check out this sometimes overlooked Fender. Upgrades from American Standard; bridge/pickups; simplified electronics; Strat-style sounds. Not for vintage-obsessed offset fans, either in function or sound. So many of us think Fender got it so right with the Stratocaster and Telecaster and that the later Jaguar squarely missed the point. In truth, the Jaguar has been garnering its own fans and players for many, many years becoming the almost default axe for anyone remotely ‘indie’: the anti-Fender for the anti-guitar hero. This continued rise in this offset’s fortunes is clearly evidenced by their elevation into the 2017 Fender American Professional range - previously the American Standard range, which never featured either guitar, despite being the backbone of Fender’s range for the past couple of decades. and a black scratchplate. 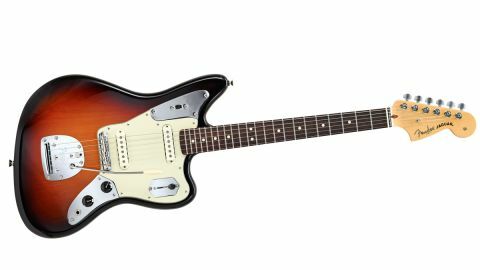 The review model also has a revised (simplified) electronics and the bridge and vibrato has been upgraded in line with Johnny Marr’s innovative work on his signature Jaguar. Then we have other Professional upgrades such as new pickups, modern ‘Deep C’-shaped neck profiles, bone nuts, narrow-tall fret wire... there’s a treble bleed capacitor and resistor circuit on the volume controls, not to mention the neat lightweight moulded hardshell case that’s included. Price-wise, it tops the range, along with the dual humbucking Deluxe Telecaster model. In the flesh, this modern-spec piece feels immediately ready to go, especially the vibrato with the new screw-in arm that stays put where you want them, and the Mustang-style solid brass saddle that isn’t individually height adjustable, but, via different radii, achieves an arch that matches the modern 241mm (9.5-inch) fingerboard radius. The modern neck design has the 22nd fret on an overhang, truss rod adjustment is behind the nut, plus there’s the easy-to-adjust micro-tilt feature that makes neck shims a thing of the past. The Jaguar ditches its dual circuit but retains its trio of chromed metal control and switch plates. The Jaguar ditches its dual circuit but retains its trio of chromed metal control and switch plates. The upper bass-side plate that originally housed the rhythm circuit controls now holds a lone two-position slide switch to voice the pickups (when both are on), in- or out-of-phase. The upper treble-side plate, which originally held the pickup on/off switches and the low-cut filter switch, now offers us a four-way lever pickup switch, voicing the three standard selections - bridge, both (in parallel), neck plus both pickups in series - that we’ve seen on various Telecasters, plus, of course, on the Johnny Marr Jaguar. This is certainly not the lightest we’ve ever played and although the slightly larger body (compared with a Strat) should add a little weight, the Jaguar is on the heavy side. Despite the unified neck shape and frets (as we pointed out in our previous review, the wire is pretty wide despite its ‘narrow’ description), the combination of the scale length difference and the fingerboard wood does give quite a different perceived feel. The neck back is satin, and as we reported before, this is a really good rounded handful that gets bigger as you move up, but not excessively so. This is a mainstream guitar and we prefer this profile to the previous American Standards. Plugged into our dual amp test rig, the Jaguar is comfortable on the strap - despite its extra heft - and the combination of the scale and more flexible string feel and shorter sustain we mentioned, not to forget the pickups, offers a subtly darker, more rounded fundamental voice that suggests those bell-like percussive tones of early spec PAFs. If that’s your bag, the three core sounds here are beautiful. The fourth series voice can sound a little too big: it ups the volume and while it’s a useful ‘extra gear’ for higher position leads, it’s almost too wide and waffly, not to mention dark, for heavy gains. But, of course, that’s where this guitar has made its mark. Plug the Jaguar into the our setup and its slightly gnarly, round high-end suits us more than another recent addition to the Professional range, the all-new Jazzmaster. Your taste may differ. And, yes, if you’re going to run some outright filth and fuzz, the out-of-phase switch works for a hugely visceral grunge attack, but unless that’s your bag, that low-cut filter from the Johnny Marr Jag would certainly help the series link to just clean up the lows a little. With apologies to die-hard Jaguar fans, we suspect many of us will be coming to these from their Strats and Teles: a third or indeed fourth Fender voice. Unlike its original incarnations, it is a more straightforward drive and play, and feels to a great extent like modern pieces. Yet it retains a ‘retro’ vibe, not least with that long, high vibrato arm with its subtle waggle - it’s very different from the almost touch-sensitive Strat vibrato. It might be time to change your opinion on these less feted Fender designs.